Screening the classics for free, every week. 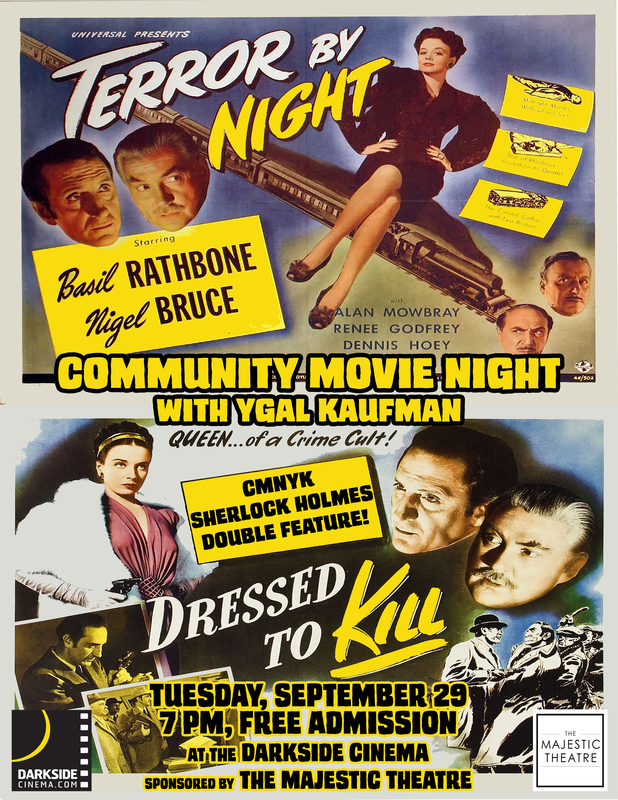 Terror By Night (1946) and Dressed to Kill (1946) Special Sherlock Holmes Double Feature! Tuesday, September 29th @ 7 p.m. This is a very special CMNYK double feature presentation of two Sherlock Holmes films starring perhaps the greatest tandem to ever take on the parts of Holmes and Watson, Basil Rathbone and Nigel Bruce. Rathbone’s Sherlock is so recognizable his face has often been the basis of drawings of the ultra-classic character for other media. Roy William Neill was the extremely prolific and talented director of 11 of these classic Rathbone/Bruce-Holmes films. There will be a short intermission in between the two features, which are only about an hour each, so the total run time for this event will still be under 150 minutes. Come get your fill of sleuthing, action, adventure, quips, hijinx and everything else you’ve come to expect from the master detective. For free. This CMNYK event is going down at the Darkside Cinema on Tuesday, September 29th, and the fun starts at 7:00 PM. As always, admission is FREE, but donations are welcomed and benefit the Darkside Cinema renovations. The show will be preceded by an intro from passionate fan of chainsaw sculptures, Ygal Kaufman, as well as newsreels, shorts, cartoons and other vintage goodies from 1946 to make the experience extra authentic. See you all there! And make sure to stop by our sponsor, The Majestic Theatre, for all their great programming. Starring Janet Gaynor, Fredric March, Adolphe Menjou and May Robson, directed by William Wellman. The twice remade classic about the harsh realities of showbiz is screened here in all its Technicolor glory. 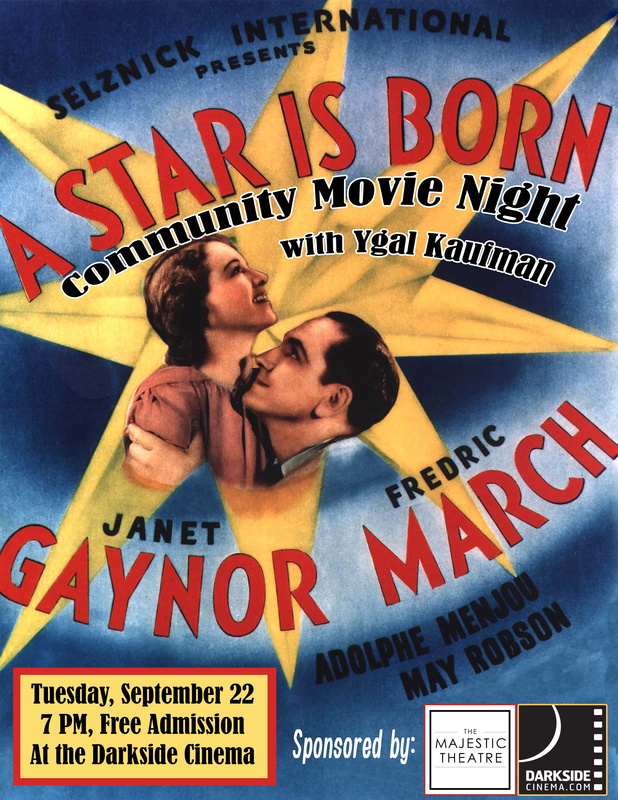 Gaynor stars as the young starlet breaking in to Hollywood who falls in love with seasoned vet Fredric March. But his self loathing and alcoholism threatens to bring down their whole happy existence. This version is indisputably (inasmuch as there’s nobody here to dispute it right now) superior to both the Judy Garland remake of 1954 and the Barbara Streisand remake of 1976. And this star studded masterpiece by one of the greatest directors of all time, the brilliant William Wellman, is at CMNYK for one week only. This CMNYK event is going down at the Darkside Cinema on Tuesday, September 22nd, and the fun starts at 7:00 PM. As always, admission is FREE, but donations are welcomed and benefit the Darkside Cinema renovations. The show will be preceded by an intro from amateur gardener and professional eater, Ygal Kaufman, as well as newsreels, shorts, cartoons and other vintage goodies from 1937 to make the experience extra authentic. See you all there! And make sure to stop by our sponsor, The Majestic Theatre, for all their great programming. And don’t forget to check out Ygal acting in An Adult Evening of Shel Silverstein, 9/11-9/20 at the Majestic! Starring Robert Motngomery and Claude Rains, directed by Alexander Hall. Stop me if you’ve seen this one; a handsome and successful man is accidentally snatched from his mortal coil a little too soon by an overly excited angel, so he’s given a second chance at making good by being inserted into the body of a different recently deceased gent (who may or may not be a rascal). You probably liked it when it was called Heaven Can Wait (1978) with Warren Beatty, or even merely tolerated it when it was called Down to Earth (2001) with Chris Rock. But prepare to love it, when you watch the original film version, based on the play Heaven Can Wait, starring the dashing Robert Montgomery as the prematurely deceased fellow and the great Claude Rains as the sage guardian of the gates, Mr. Jordan, who gives him a second chance to make good. Hilarity and redemption ensue in this warmhearted classic. 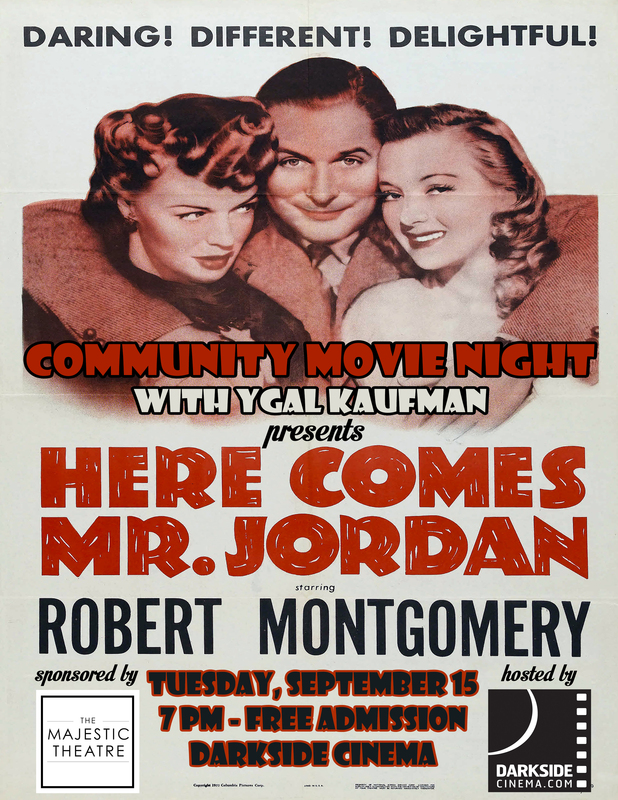 This CMNYK event is going down at the Darkside Cinema on Tuesday, September 15th, and the fun starts at 7:00 PM. As always, admission is FREE, but donations are welcomed and benefit the Darkside Cinema renovations. The show will be preceded by an intro from Corvallis’ favorite Clevelander, Ygal Kaufman, as well as newsreels, shorts, cartoons and other vintage goodies from 1941 to make the experience extra authentic. See you all there! Make sure to stop by our sponsor, The Majestic Theatre, for all their great programming. And don’t forget to check out Ygal acting in An Adult Evening of Shel Silverstein, 9/11-9/20 at the Majestic! Enter your email address to follow CMNYK and receive notifications about upcoming screenings, contests and delicious meals we've had. Special presentation of Sergei Eisenstein's legendary film, with live music played in the theater by Justin Schepige and Kevin Van Walk. Battleship Potemkin (1925) with live music! The Big Wheel (1949) Tuesday, October 18th at the Darkside Cinema, 7 PM Free Admission!! The Milky Way (1936) Tuesday, August 16th, 7 PM, Darkside Cinema, Free Admission!